Jewish Agency chairman Natan Sharansky urges gov't to invest more money in Aliyah, ahead of expected 15,000 new immigrants in 2015. Jewish Agency Chairman Natan Sharansky believes that a long-term plan for new immigrants is necessary, he stated in a special interview with Arutz Sheva on Tuesday morning - because, otherwise, thousands of Jews fleeing from Europe will prefer Canada, the US, and Australia over Israel. Sharansky applauded a long-term plan approved by the Cabinet on Sunday to help absorb thousands of potential immigrants, calling the development "very positive." "We have an increase in immigration [in general], not only because of recent events," Sharansky stated. "There is such an increase in immigration from Western Europe, especially from France. Recent events encourage people to think about the future outside Europe." 7,000 immigrants arrived in Israel in 2014, Sharansky noted - and some 15,000 are expected in 2015. French Aliyah, specifically, is the subject of a large-scale and ongoing government program to bring French Jews home. France has been named as the West's most dangerous country for Jews, and anti-Semitism doubled there in 2014. Ahead of the immigration boom, Sharansky has urged the State of Israel to build or allocate more buildings as absorption centers - government-owned apartments for new immigrants to ease the transition which have low rent and offer services to new citizens - and to educate incoming immigrants about various cities and communities. "When we asked why we shouldn't think about the long-term, about immigration in larger numbers, the legal adviser told me not to make decisions beyond the 2015 budget," Sharansky noted. "I emphasized that we are in the midst of a historic time - not because of the elections, but because half of French Jews have decided that their future is not in France. That's hundreds of thousands of people." "We are in competition with Canada, Australia and the United States - and we want them to choose Israel," he continued. "We should act now to ensure that emigrants can feel that Israel is their home - to provide housing and employment incentives to be the answer for hundreds of thousands of people. To do this, we need to have our work under the Prime Minister's direction." 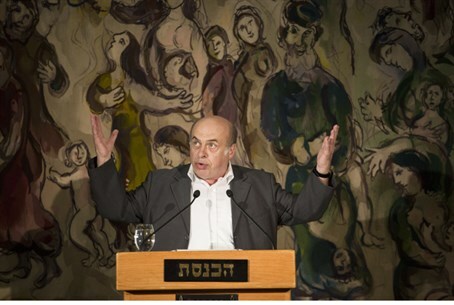 Sharansky also disagreed with the idea that the Israeli leadership is afraid to be as vocal as it can be about encouraging Jews from the Diaspora to immigrate to Israel. "The prime minister talks about it all the time," Sharansky noted, adding that he was prepared to accept delays in the pro-immigration program by a few weeks due to legal considerations in the volatile pre-elections period - but not for longer. "With all the reservations and the criticism, as soon as we see a chance to see a large increase in immigration to the State of Israel, we need to allocate money for these programs without delay," he urged. "I am worried that because of political arguments, we could miss the unique opportunity in the history of European Jewry." "This is the first time that there is potential for immigration from emigrants who choose to leave," he noted. "There was no freedom of choice for Jews from Yemen or Russia. But now, emigrants weighing the decision have a choice - between us, between America, Australia, and Canada." "We want them to choose the land of Israel," he said. "It is up to us to help them create their connection to Israel, and for the government and Jewish Agency to follow through on this and provide solutions." "Many of them live in public housing and have $70,000 in the bank," he noted. "With that kind of money, it's impossible to buy an apartment in Israel - and with no special mortgage rates and buildings for immigrants, as it was in our day [with Russian immigration in the eighties and early nineties - ed. ], they cannot plan to buy an apartment in Israel." "Without these, they will look elsewhere," he added. Sharansky further noted that the media has sometimes portrayed him as "the prophet of doom" regarding European Jewry, but he insists that "there is no future for Jews in Western Europe." "It can take 5 years or 20 years, but there is a strengthening of the Islamist community and the growing hatred of Israel from the direction of the liberal community," he said. "The two things together make Europe a very uncomfortable place for Jews. It is not clear how many years it will take [before a mass exodus - ed. ], but they need to know the nearest and most attractive option is Israel." According to Sharansky, the Israeli leadership has no problem with public calls for Diaspora Jews to leave, especially when it comes to Europe, where it is a clear reality that there is not the same kind of close connection with Israel as, say, the US has. the American kind as connection to Israel. He mentions that practically all European community leader who has a family half live in Israel. "This is not United States. there are not scared when they say their house this shock in Israel. " "There is a better and more meaningful life here," he concluded. "There is a better future here."